The Tegalalang rice terrace near Ubud is home to the most famous rice fields in Bali. A truly awe-inspiring sight, the beautiful green rice paddies stretch on for what seems like an eternity. 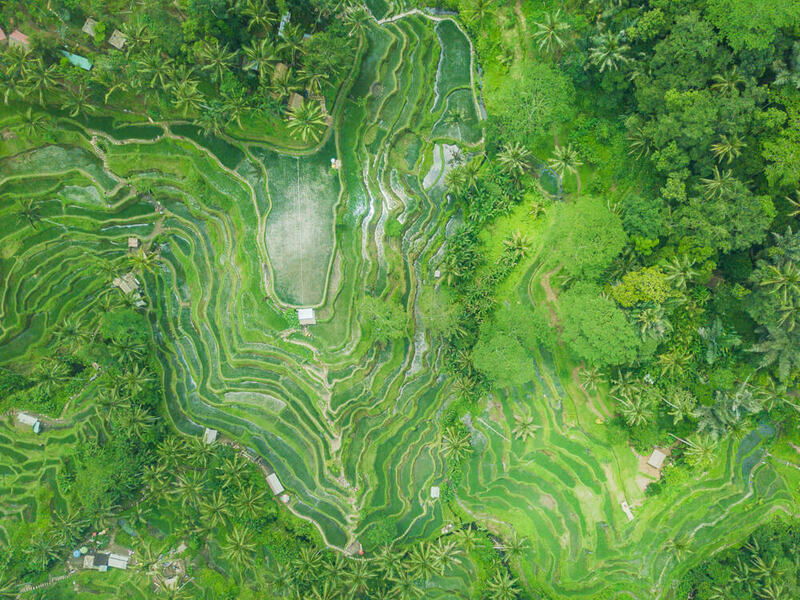 You can easily spend hours getting lost amongst the various pathways through the wonderfully green terraces, which are an essential inclusion on any Bali itinerary. Without a doubt, the Tegalalang rice terraces are one of the most beautiful places to visit in Bali – we can vouch for that! 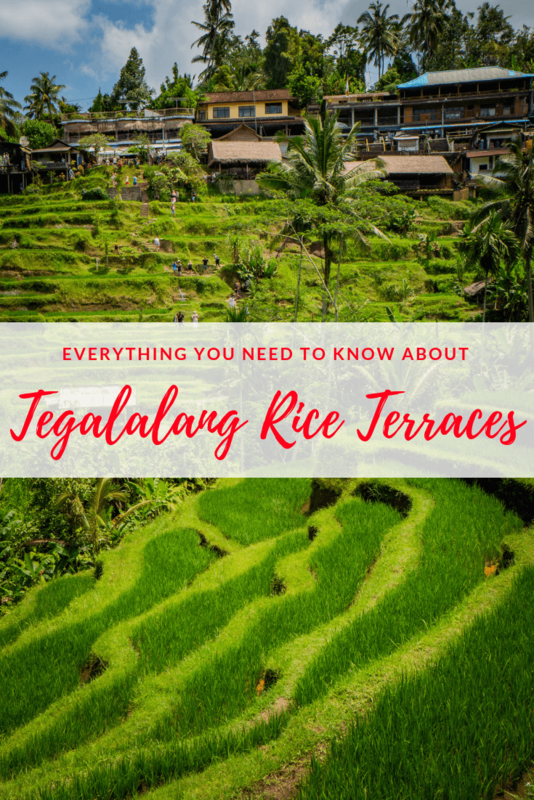 Find out all you need to know before visiting with this travel guide to the Tegalalang rice terrace. Planning a trip to Bali? Make sure to check out our top tips for travelling to Bali! The entrance fee for the Tegalalang rice terraces is 10,000 IDR per person. There is a ticketing booth in the car park, as well as both ends of the road. It’s worth noting that this fee doesn’t give you full access to the rice field. If you want to walk through the Tegalalang rice terraces you will come to a number of booths, which require a mandatory donation to pass. Unfortunately, there is no alternative so you will have to pay more to access all areas of the rice fields. Generally, no minimum donation is specified, however one local insisted on a minimum donation of 10,000 IDR. Make sure you have some smaller notes in order to cover the cost of these ‘donations’, so that you can see all of the terraces without restriction. Although the Tegalalang rice terraces are open 24 hours a day, there’s not much point of visiting them in the dark. To truly appreciate the beauty of the terraces you should make sure you arrive with plenty of time to enjoy them before the sun sets! 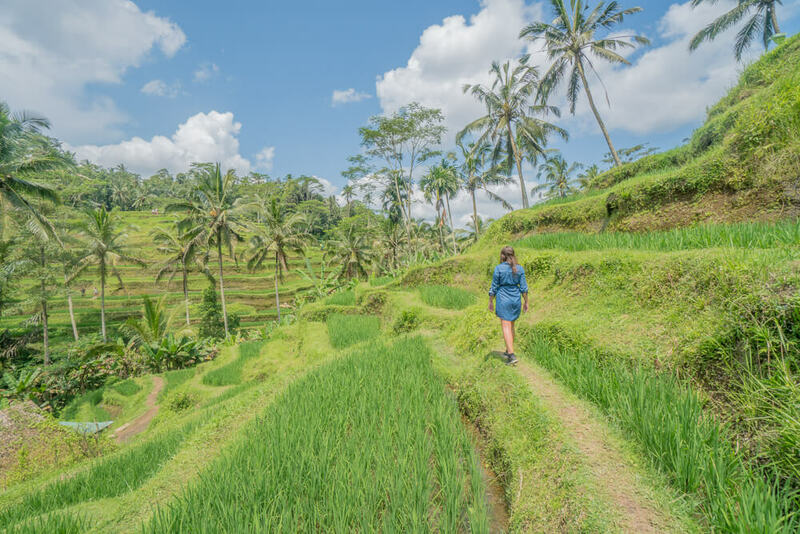 Visiting the Tegalalang rice terrace is one of the best things to do in Ubud, as the terraces are just a 20-minute drive from the town centre. The cheapest way to get to the rice fields is to rent a scooter/bike, which should cost around 60,000 IDR per day. Parking a scooter costs 2,000 IDR in the car park at Tegalalang. Alternatively, you can take a taxi from Ubud to the Tegalalang rice terrace, which should cost around 100,000 IDR. Drivers will try to charge substantially more than this, but if they quote a much higher price then just find another driver! As there are plenty of things to do in the Ubud area, we recommend hiring a private taxi out for a day. This should cost around 500,000 IDR. Head left out of the car park, which will lead you to one of the entrances to the rice terraces. Once you get into the rice fields, you can wander around as you please and enjoy the beautiful scenery. As mentioned above, make sure you have small notes to give as donations in order to access all of the terraces. To see the rice terraces at their greenest visit in March, April, September or October as this is when the rice is about to be harvested. Between April and September the fields have more of a yellow tint, but are by no means less beautiful. The rainiest time of year in Bali is between December and February. During these months, the terraces are lovely and green, but it’s not an ideal time to visit, as you may have to spend your day outside in the pouring rain! Getting to Tegalalang at sunrise means you can witness the light rays break through the trees in this tranquil setting. Sunrise is also the best time to visit if you want to avoid the crowds. If you’re not much of an early bird but still want to visit at a quieter time, then visit before 10am or after 4pm. Visiting at this time should mean you avoid some of the tourist crowds as well as the intense midday sun. Eat with a view – A number of cafes/restaurants overlook the rice fields. Pick a cafe or restaurant with a balcony seating area so you can enjoy views of the Tegalalang rice terrace from a different perspective! The restaurants are generally more expensive than elsewhere in Bali, but it’s worth it for the view. Tegalalang rice terrace swing – For a different way to experience the rice paddies try one of the many swings around. It costs 100,000 IDR for a few minutes on one of the swings. Shoes – Wear comfortable shoes as there is a fair bit of walking involved and some of the paths can be quite steep! Bring a hat – There isn’t much shade in the rice terraces, so it’s worth bringing a hat or even an umbrella for some extra protection! Drone – If you have a drone you’re able to get an incredible perspective of the Tegalalang rice terraces. We were so impressed with the amazing aerial views that we couldn’t resist adding a drone to our guide of what to pack for Bali! 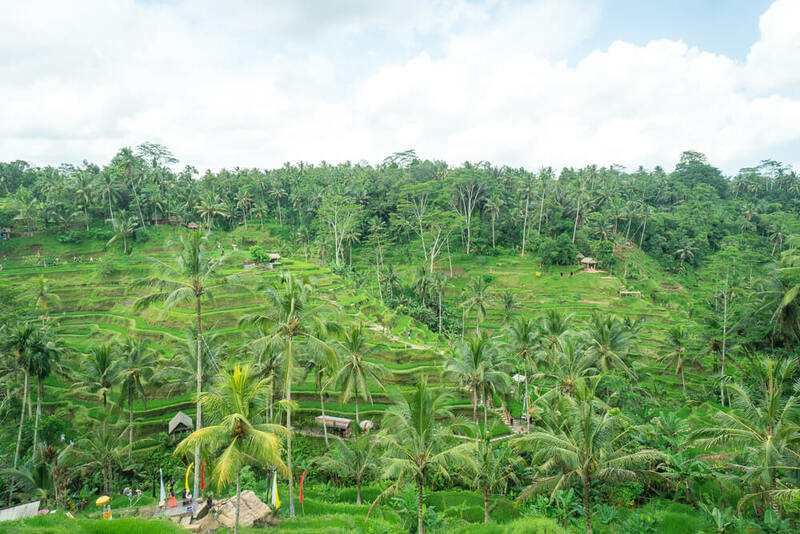 Day trip – The rice terraces are a great inclusion on a day trip around Ubud. You can hire a driver for a full day tour for around 500,000 IDR to visit a number of places like Tukad Cepung waterfall, Kanto Lampo waterfall, the Ubud monkey forest and more! Tour – A tour is not needed for the Tegalalang rice terrace, as it’s an easy place to explore on your own. 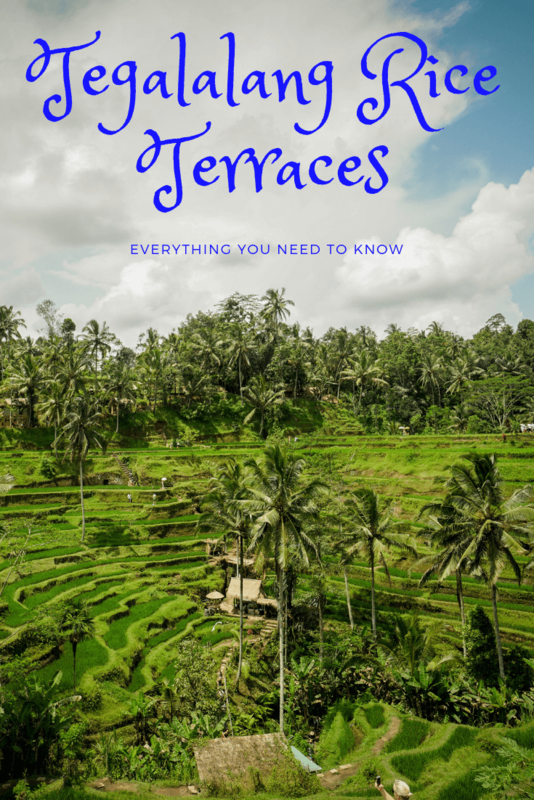 Like this guide to the Tegalalang rice terrace in Ubud? Pin it! We’re glad you found the post useful. Hopefully you have an incredible time in Bali!